Edit (February 23, 2016): Okay, I'm DONE with this review. I'm disabling the notifications, so if someone comments in it, I'm not gonna now. The level of trolls it has gotten has reached levels I cannot stand anymore. Of course, there are reviews with more trolls, but this is as much as I can endure.And for you, ignorants who can't accept other people's opinions (better known as "trolls"), why don't you go read one of the many thousands of 5 star reviews instead of coming to criticize an opinion that's obviously different to yours? Don't you understand it's pointless? I'm not going to stop hating this book if you tell me "I'm wrong." In fact, if anything, your words only make me feel nauseas when I think of this piece of garbage.And that's my final word. I won't be replying to any comment in here, I don't care why you love this (write your own review for that) and I won't read the rest of this series.______________________Original review:The first thing you need to know about me is that I hate cats. HATE THEM. They're are the living creatures I dread the most after roaches. I'm serious. I can't think about cats without flinching. I hear one, and I shudder. I see one, and I want to vomit. One gets near me and the good girl inside me is in risk of going far far away. I just can't stand them.The second thing you need to know is that I hate stories about talking animals. I literally cannot watch a TV show or a movie where there are talking animals without going insane. Really, I get so exasperated and furious I fear my heart will stop working.Those previous points led me to think I was not going to like this book, but I decided to try anyway because I've had pleasant surprises, for example, The Monstrumologist. That book had monsters and my eyes just roll until almost popping out of my head whenever I hear that word mentioned, BUT I LOVED that book/series, so with the hope of that thing also happening with this book, I finally gave it a try.I regret my decision.Why? Perhaps this is the most ridiculous book I've read after Twilight (and we're talking about one year). I just couldn't buy the concept. Clans of cats fighting? The hell? Yep. That's all this book is about. Some might say it's an original concept, but for me? It's just laughable.Also, the amount of absurd names was overwhelming to the point where I wanted to kill myself. Look at some examples:→ Tigerpaw, Graypaw, Firepaw, Lionheart, Dustpaw, Sandpaw, Bluestar, Ravenpaw, Yellowfang, Longtail, Smudge, Crookedstar, Tallstar, Blackfoot, Dappletail, Redtail, Oakheart, Darkstripe, Spottedleaf, Frostfur, Raggedstar, Nightpelt, etc.You may have noticed that I highlighted some of the names... Well, it's because READING ALL THOSE FREAKING -PAW, -STAR, -HEART, -TAIL TERMINATIONS MADE ME WANT TO KILL MYSELF!! !Some awkward sentences contributed to my almost madness too. Like this:“We got back in time,” she meowed with a gasp. “The kits are safe!”Meowed... with a gasp? That's like trying to talk while swallowing... or like gasping and talking at the same time. I tried doing it and I failed. My brother tried and he failed too. My mother is part of this group too and my sister as well.This felt just as wtf as the previous one:Yellowfang looked up at Bluestar and narrowed her eyes respectfully.Narrow eyes respectfully?How do you do that? Like this?Or maybe like this?[Damn. Aren't you a creepy one, Cinderella's stepmother? ]This one might be an option too:For me, they all look the same (except some are more hate-filled), don't ya think?The unnecessary deaths were also another bug for me. Like, I didn't even get to know the character yet he died and I'm supposed to feel bad? For example, there was a Redtail (yeah, ludicrous name - don't even mention it) at the beginning. I didn't know who that was, and there comes some cat telling everyone Redtail's dead. I mean, wtf, who the hell is Redtail?And I'm not only talking about his death. There were many pointless ones. Why did they die? Just to... give more emotion to the story, I suppose? Well, Hunter, BIG FAIL HERE BECAUSE I COULDN'T CARE ANY LESS.Anyway, I'm sure I bashing a book most people love, but maybe this didn't work for me because it simply was ridiculous not a book targetted to my age. If you're a fan of talking animals and you love stupid stories about pointless "warriors" cats, then this might be just for you. So...Warriors. No, not that awesome 80's flick starring that guy from Xanadu. Unfortunately. Warriors, Into the Wild is Book 1 of 6 (SIX!!) in the first of like---- a zillion series. My 10 yr old daughter is in love with these books---she can devour one a day (and the way that they are churned out....) She is so into these that she asked my husband and I to give them a shot. Fine, I can take one for the team, I mean, heck, she's reading, right?Thing is, it's not so bad. You've got a li'l bit of Tolkien and a splash of Shakespearean tragedy in a Jets vs. Sharks sorta way... It makes for a lively story.Here's my issue...So, you have the kittpet, Rusty, longing to pounce on mice and rabbits, tearing into their cold, fuzzy, flesh--he meets Graypaw and is introduced toThunderclanand meets Lionheart and TigerclawandDustpaw and Sandpaw and they take him in and he becomes Firepaw and apprentices with Bluestar butTigerclaw has this chip on his shoulder and doesn't like him and he runs into Yellowfang and falls for Spottedleaf, then has to save the honor or Ravenpaw who watchedRedtail be killed by Oakheart, but it wasn't Oakheart it was Tigerclaw and meanwhile you have Shadowclan, which is Yellowfang's old gang and they're led by Brokenspear who has daddy issues and offs Raggedstar and sendsClawface to capture Frostfur's kits so there's this A-Team like maneuver to invade Shadowclan that Whitestorm leads and then Graypaw becomes Graystripe and Firepaw who was Rustynow becomes Fireheart... Breathe...See? This book is about a house cat who is tired of being a house cat and wants to go into the wild. Then he mets a kitten from a 'clan' and goes with him into the forest and mets the rest of the Thunderclan. This book sounds boring, but really, it is a great book. The author is very descriptive and makes it all very interesting. There a four clans, Thunderclan, Windclan, Riverclan and Shadowclan. The whole series, and there are a lot of them, is about the four clans fighting to stay alive and also trying to be friends with the other clans. There are also new series, calld the New Prophecy, they are about different cats and different problems, but all the series join together. It really doesn't sound that great, but you should just try, you will be suprised. This is the first book out of all of them, after you have read it though, you need to read the rest. These books are written terribly but they've actually got pretty developed characters and they basically made me fall in love with reading in third grade or whatever? so. four stars.I actually want to talk about why these stupid books made me fall in love with reading, because they truly influenced me so much. I think the best thing about this series is the developed character work. This is a series that has defined characters who you can root for or dislike, which is awesome. I actually think the characters improve throughout the series. In series one, Fireclaw is kind of a typical boring do-gooder. Brambleclaw, Leafpool, and Squirrelflight, the main characters in series two, are far more interesting and defined, with clear motivations beyond "do the right thing." This trend continues in series three and four. I also really appreciate the occasional morally grey or morally black characters. Yes, many characters are a bit "I do good things and I'm amazing!!" but characters like Ivypool, in the fourth series, were so influential to my childhood. Yeah, the plot is a little weird and far-fetched, and the writing is pretty terrible now that I've grown up enough to see it, but this series is definitely good for anyone who likes middle grade fiction. Especially kids. This is definitely a series I'd give to all elementary schoolers. My kids adore these novels, so I knew it was only a matter of time before I had to read them too. I figured I'd like them. After all, I like middle grade and YA fiction, and cats are cool, and Watership Down was one of my favorite novels of all time. So how could a book about warrior housecats go wrong?If you're one of those people that hate cilantro, than any salsa with cilantro in it is going to hit your "ick, soapy" button and displease you. This novel hit a lot of my ick buttons. For one, it has a lot of exclamation points in it, which I generally interpret as a crutch for weak writing. Also, Hunter rarely uses "he said" or "she said" preferring instead "meowed, responded, purred, snapped, suggested, answered, called, growled" etc. Also, the names drove me batty. Young cats have -paw as a suffix, leaders have -star as a suffix, and the others have a different suffix. so you have nothing but compound names. Firepaw, Ravenpaw, Brokenstar, Bluestar, Tigerclaw, Lionheart.Once I'd already had my pet peeves hit,I started looking for reasons to explain why I didn't want to finish it. I think part of it is that the cats don't act like cats. That's probably not fair, because I read Tad Williams' Tailchaser's Song and liked it, but for some reason I wasn't able to suspend my disbelief here. Housecats are not social in the way that dogs, rabbits, deer, wolves, sea lions, and other animals are. To have them forming clans, and caring about such things as group cohesion and honor (honor? Cats?) made them feel more like dogs, or like aliens that I didn't understand. I also don't think that cats cache kills for later. I know for certain that cats have no herblore whatsoever, but I'm a big reader of fantasy, so I'm not sure why I wasn't able to swallow it here.That's not to say that I don't recommend this book. Both my daughters (ages 8 and 10) adore these books, though the younger one is not a strong reader and prefers the graphic novel version. My niece (9) also adores these novels, as do her friends. So clearly, there's something here they're taking out if it (a story about kitties). They probably also are responding to the tried-and-true plot of "boy from humble origins learns from his elders, grows, and eventually surpasses those who taught him to become the greatest of all." The plotting isn't terrible, and I did care about what happened, I just wasn't willing to wade through the irritating prose to get there. So I cheated. A hundred pages from the end, I gave up and asked my kid what happened. Spoiler alert: nothing you haven't predicted by chapter four. This review is by Pippi, guest reviewer, age 1 and a half; tabby cat.This is a book about cats who live in the wild and they catch mice and eat them and they fight. There are four colonies of cats and one of them is mean and steals the other colonies food.At first I thought this book was hard to read because even though it's written in English they try to translate cat words into English so it's hard to follow at first until you get used to the cat words.At the beginning of the story Rusty is a housecat and humans take care of him but then he decides he wants to be a warrior so he joins a clan of cats. They never say what happens to his humans but I bet they miss him a lot. There are not many humans in this book and the ones that are are bad humans. I live with nice humans so I don't know what this is like.Mama says I should read Watership Down because the human author did a nice job of making a story about animals that sound real, kind of like this book does, but that story is about bunnies and who cares about bunnies anyway? I wanted to give the Warriors books the old college try, seeing as I love both cats and animal stories. I had seen how wildly popular they are among the YA readers in my library, and I do enjoy well-written YA novels. But this one turned out to be more of a furball than a saucer of milk. Perhaps if I were fifteen years younger, I’d be devouring the Warriors books. But by now, the story contained in Into the Wild seemed trite and contrived; a watered-down version of a hundred other animal adventure tales. (The cats’ increasingly ridiculous “wild” names are enough reason to throw in the towel.) Perhaps it’s a case of too many cooks spoiling the broth: “Erin Hunter” is not an author, but rather a pseudonym for the multiple authors who churn out the series—which is more prolific than an unfixed colony of feral cats.Which brings me to another concern. Although the books are (obviously) fantasy, I was a bit concerned about the glamorization of the lives of unaltered, roaming cats. Neutering is depicted as a plague upon catdom and sterilized felines are shown as lazy, uninteresting, and stupid. When one considers the dismal chances of cats in animal shelters (and for ferals, the euthanasia rate is nearly 100%), it’s not unwise to consider the reflection of attitudes about cats in popular culture. This one’s as stale as last week’s catnip. This is the first in the series, I didn't read it for a long time, and then I picked it up. It was so good, I just had to keep reading it. If you don't like cats fighting, or blood described, it doesn't necessarily mean you don't have to read it, there are plenty of othergoodparts in the book, especially where Graypaw, Ravenpaw and Rusty (known as Firepaw in the book) make friends of each other. A brutal part is where Oakheart dies, but the story gets all mixed up, and eventually, drives Ravenpaw out of the ThunerClan camp!Read on to find out more of this adventurous and mystery like book! This is my daughter Jess' review. Jess is 11.This review won the Ultimate Book Reviewer Award given by her school's Language Arts teacher. Do you ever wonder what your pet cat thinks about? Fantasy author Erin Hunter brings you this spine-tingling, action-packed, fantasy adventure novel about wild cats. Explore and experience the land from the eyes of Rusty, a common house cat that dreams about the forest and all its wonders. One fateful day, Rusty finds himself walking towards Thunderclan camp, a whole new world where wild cats fight as warriors under the warrior code. Medicine cats used their knowledge of herbs and cures to heal the wounded, and apprentices trained with their mentors to become full-fledged warriors. All this happens beneath the leader's rule, and that leader just happens to be Bluestar, the cat that Rusty met outside his house gates. Training to become a warrior of Thunderclan, Rusty now named Firepaw, must faced the dangers that lurk in his path to becoming a warrior. Once such danger is Tigerclaw, the fierce and ambitious mentor of Ravenpaw, his timid friend. With Redtail, the deputy dead, Tigerclaw claims that he saw Oakheart, the Riverclan deputy, kill him. Firepaw then proceeds to ask Ravenpaw, as he was the only cat that was there to witness the murder. Firepaw wants answers, but he know he cannot get them in Thunderclan camp, knowing that Tigerclaw will attempt to kill Ravenpaw to keep him silent. Graypaw, Firepaw's new best friend, accompanies him while escorting Ravenpaw to an abandoned barn on the moors. The characters are the reason I loved this novel. They were all described wonderfully, and each cat has different traits and personalities. They all look different too!! Fur colors range from an ordinary brown to a spectacular golden tabby fur. There are so many creative ideas put into this book, and one of them is the idea that wild cats live in big groups and depend on each other for survival. It's really, really hard to choose a favorite character out of this book, because there are so many cats to choose from. But if I really had to pick up one, I'd choose Graypaw. Who wouldn't love a stubborn, friendly gray kitty who likes to crack jokes? I also like that supportive, helpful attitude of his. He's not afraid to stand up for his friends, and he's always going to be right there next to you if you need help, though he can get a little carried away sometimes, I think he's generally a great friend to have.If fantasy and adventure novels catch your attention, then this is the book for you! It has very descriptive writing that puts images in your head, and the tension and emotions that the characters display might just give you goosebumps! To find out what happens next, you'll have to read the book! Are you a cat or a dog person? If you answered cat, this book is for you!It follows the adventures of a house cat who escapes into the woods and joins a tribe a fierce wild cats who regularly engage in battles for more hunting territory. The plot has a lot about nobility and it is easy to see parallels between this story and classic stories of knights and squires such as The Knights of the Round Table. As an English teacher, I have several students who love this book and the entire series it is a part of. It is a fun and fast paced read and I would recommend it to those who are looking for a easy to read, breeze of a story. This is the book that started it all for me. I've always loved reading, but this is one of the first books I can really remember absolutely devouring. I believe the series isn't what it used to be after 100+ books, but this first arc and the journey we go on with Fireheart will always remain one of my favorites. I've read it countless times and never get tired of it. This book is the very first in the Warriors series by Erin Hunter. In a forest four clans of wild cats live in constant turmoil. 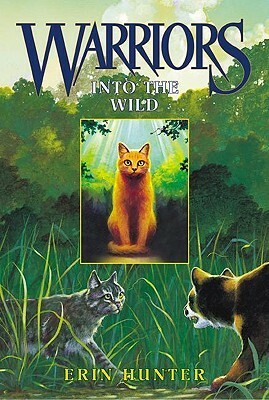 This book focuses on ThunderClan, and an apprentice named Firepaw who joins that clan. Wow, this is a dumb book.My main gripe here is that these characters are not cats. Despite the grumblings about twolegs etc, they really don't think like small, semi-social predators. These are humans in cat suits: little furry Magical Native Americans (tm), or at least someone's warped view thereof. It feels like it's trying to be Watership Down with cats, but seems to fail to realize the reason why Watership Down is so awesome is because the Watership rabbits are RABBITS: they're not human, they don't think like humans, they're their own unique culture underground and have uniquely lapine problems.It almost would have been better, or at least more honest, if the characters were anthros or something, but aside from being xenofiction that doesn't put enough thought into actually being xenofic, the main character is an insufferable little Marty Stu.So much wasted potential. Kitty xenofiction has been done and done much better. If you can find it, try out The Wild Road and compare and contrast. Erin Hunter - Erin Hunter is the pseudonym of five people: Kate Cary, Cherith Baldry, Tui T. Sutherland, Gillian Phillips, and Inbali Iserles, as well as editor Victoria Holmes. Together, they write the Warriors series as well as the Seekers and Survivors series. Erin Hunter is working on a new series now called Bravelands. Erin Hunter is inspired by a love of cats and a fascination with the ferocity of the natural world. As well as having a great respect for nature in all its forms, Erin enjoys creating rich mythical explanations for animal behavior, shaped by her interest in astronomy and standing stones.